Expansion and retreat of sea ice varied consistently in pace with rapid climate changes through past 90,000 years, a new study in Nature Communications shows. "The Arctic sea ice responded very rapidly to past climate changes. During the coldest periods of the past 90,000 years the sea ice edge spread relatively quickly to the Greenland-Scotland Ridge, and probably far into the Atlantic Ocean." says first author Ulrike Hoff, a researcher at Centre for Arctic Gas Hydrate, Environment and Climate (CAGE). Sea ice amplifies the climate changes that are occurring at any given time. Its growth and melting has profound effects on climate, the marine environment and ocean circulation. Hoff and colleagues studied the past distribution of sea ice, in the so far longest existing sea ice record in a marine sediment core. The core was retrieved from 1200m water depth from the ocean floor of the Nordic Seas, just off the Faroe Islands. The core represents 90,000 years of sediment layers, and it is by studying those layers that scientist can reveal the changes in sea ice and past climate. It was the tiniest of evidence in these layers that brought this strong confirmation of sea ice behavior to light. They are a type of phytoplankton, called diatoms, and they are everywhere around you. Diatoms are single celled algae with a cell wall made up of silica. "They are the golden brown coating in the glass of a street lamp, and shiny stuff in your make-up. They are even used in tooth paste as a cleaning agent.," says Hoff. 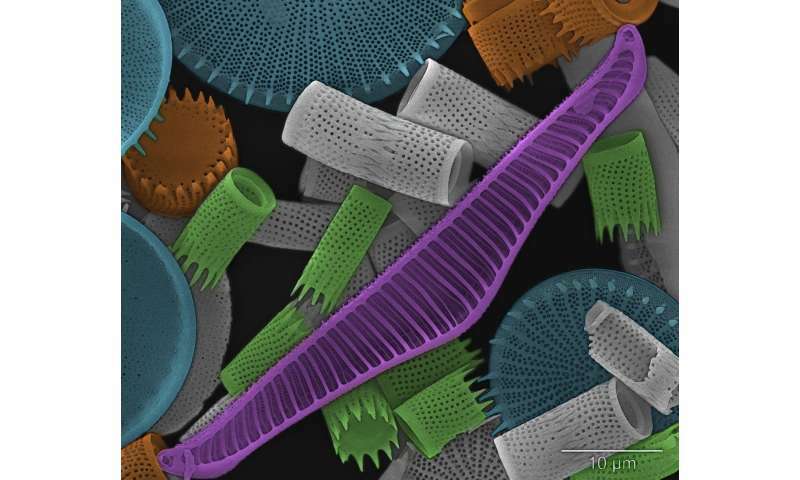 "Diatoms are truly amazing, and can be preserved in marine and lake sediments for millions of years. 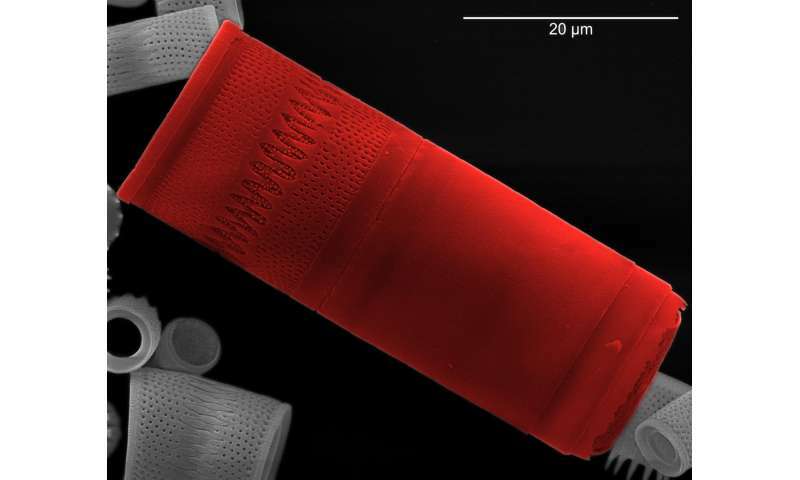 I have personally examined diatom fossils that are 65 million of years old, and they look much the same as the diatoms that we find living today"
Not only could Hoff and colleagues assert whether the Nordic seas were covered in sea ice by studying the diatoms, they could also estimate how thick the ice cover was and whether it was seasonal or perennial. Sea ice retreated abruptly during warming events; spread rapidly during cooling phases, and became near perennial and perennial during cold periods and Heinrich events, the study states. A few specific species of diatoms use sea ice as habitat; they are attached to the ice itself. If you dive under the ice you can see them as a golden brown coating underneath. But being algae, they depend on the suns rays that penetrate through the ice for photosynthesis. If the ice is too thick, the sun does not reach them, and the production falls rapidly as a result. "By classifying the diatoms in particular sections of the core, and counting them, we could calculate their abundances and estimate the ice thickness. Doing this, one has to keep in mind that as soon as they die, diatoms are quite frail in the salty water. The ocean is quick to reclaim the silica of their valves - and they dissolve. " However, as they fall to the bottom of the ocean, they release a very specific lipid called IP25 - Ice Proxy with 25 carbon atoms. It is a molecule that does not dissolve as easily in seawater. By testing the core for this lipid, the scientists could determine if a certain diatom population was present in the ocean and how well developed that population was. Rasmussen points out that the sea ice profoundly influences the behavior of ocean currents, which in turn influence air temperature. 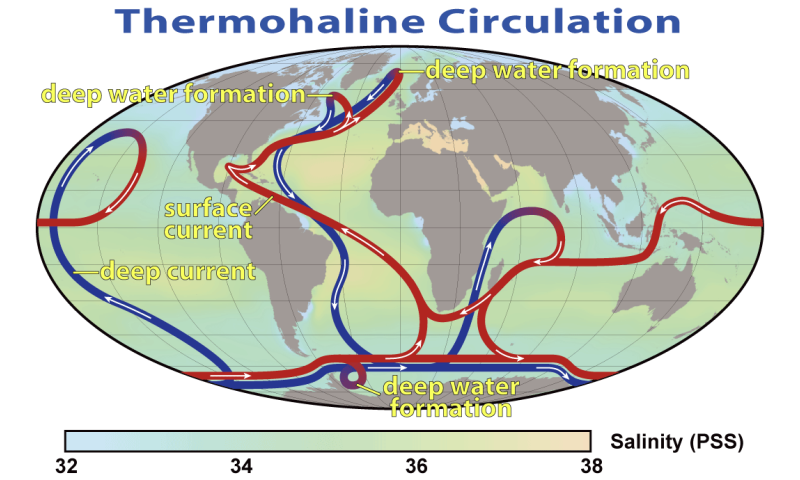 For example permanent sea ice cover is not good for deep-water formation, a process that essentially powers what is colloquially known as The Gulf Stream. "Understanding the influence of sea ice on climate changes and ocean currents of the past, helps us understand future development in the ever warming climate." Rasmussen says.